The shiny steel tracks led into the distance for as far as eleven-year-old Lee Sing could see, which was a long way—farther than the children from the nearby Shoshone village could see. Sometimes Lee would go hunting with them. He could spot a rabbit in the hot noon sun where no shadow betrayed its still form. The Shoshone said that a giant iron horse would run on this path one day. They said that it screeched and puffed like an angry spirit, but that it was cursed to ride only on the steel to which it was bound. They said the fan kuei were trying to make it run around the world. Lee did not know how they could do that, since the world was big, and he knew from first-hand experience that most of it was water. His life was bound to water. His mother and his brothers and his sisters had died when the Yangtze River surged over its banks. Thousands had died. He and his father had been helping his uncle with his fields up in the hills. Everything was gone when they’d returned. Bereft, his father took Lee to the port in Kwangtung province and boarded a ship. It was the biggest thing Lee had ever seen. They sailed out onto the unending ocean. At first, Lee thought the Yangtze had swallowed the entire earth. 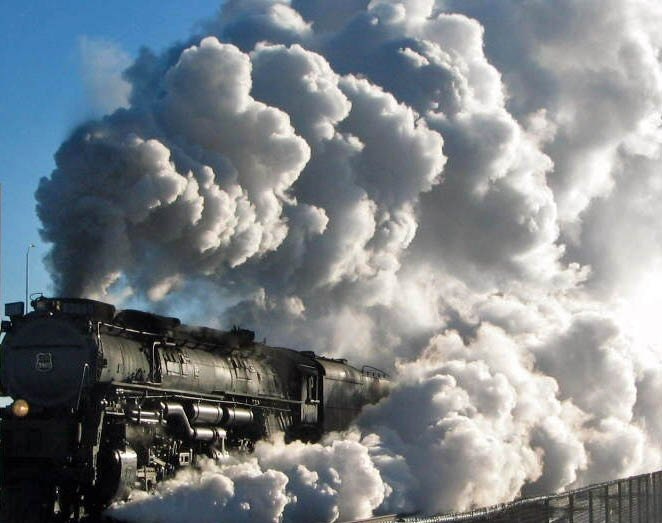 But the waters eventually ended in America, where his father signed up with the Railroad, the master of the great iron horses. 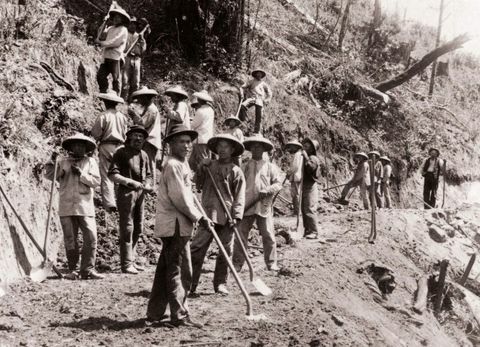 He and his father traveled by wagon up into the mountains to work on laying track. Lee Sing was glad it was dry here in Utah. Lee walked quickly. He was very proud to keep the water buckets from sloshing at either end of the long pole balanced across his back. The water would fill the kettles back at the camp. His father and the other men and women who worked laying track for the Railroad would be back soon. At the end of each day, the Indian men and women would walk back to their village. The foreman was always happy when they camped near a Shoshone or Paiyute village. The women did even more back-breaking work than the men, so the railroad “made good time.” Shoshone women were very used to carrying heavy loads. The American workers would get their ration of whiskey and line up for chow. Before the Chinese workers would eat, however, they would bathe. Using whiskey kegs as bathtubs, they would take turns washing away the day’s grime, easing strained muscles with the steamy water. Lee walked into the camp as the first crews returned. He poured the spring water into one kettle and scooped out hot water from another to pour into the kegs. Then he scrambled up to the rocky outcrop at the edge of the camp to pick out his father among the hundreds of workers as he returned from the work site. Each day Lee tried to find him in the throng from farther away than the day before. Every day the tall men ridiculed the Chinese workers, who were religiously fastidious. This time, a tall red-head with a scruffy beard picked up a clump of dirt to fling at the man in the tub. Thwack! “Ow!” He dropped the dirt abruptly as the handle of a riding crop hit him on the ear. The red-haired man glared up at the foreman astride his horse. “Hector, leave the Chinee alone. You stink as bad as that grade you and your crew laid up there today. When you can do better than the coolies, then you can say somethin’ about how they smell.” The coolies laid the most accurate grades of track through the mountains, despite never even having seen a railroad train. Lee stood there, staring at his feet. He could not make the words make sense. One of the Shoshone men stepped around the foreman’s horse. Lee looked up, bewildered. He was the father of one of the boys from the village. Lee had collected reeds and branches with them for the women to make baskets. “Son, go with Washakie,” the foreman said and started to ride away. The Chinese workers started to gather. The foreman looked from coolie to coolie. They stood staring intensely at him w ith quiet regard. He couldn’t afford to aggravate his best workers. It could put them behind schedule. “All right. I’m a fair man.” He reached into the pouch at his belt and handed over a few coins to Washakie. He directed his horse around Washakie and rode to the boss tents. Washakie handed the coins to Lee and laid his hand on Lee’s shoulder. “You are Shoshone now, Sharp Eyes.” Then he hefted one of the empty kegs up to his shoulder and strode toward the village. Lee followed, peering over his shoulder down the track, and wondered if the iron horse would come with crimson eyes and sharp teeth. “The Story of Sharp Eyes” was first published as a contest entry at A Word with You Press. The story is based on a true story. 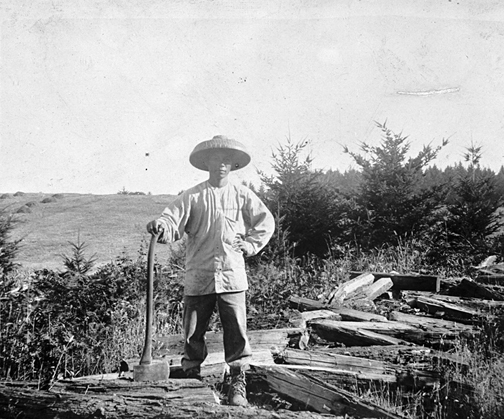 The story of Lee Sing is known only from a couple of sentences in a historical blog about the Chinese who had worked on the transcontinental railroad. The description of the treatment of the Chinese, both the respect for the accuracy of their work and their outcast status because of their fastidious habits are also based on historical references. Learn more in this short video. potential photos and images are kept. undertake to be licensed to to so? I’m glad you enjoyed Sharp Eyes, which I hope I attributed properly. It is based on true accounts taken from native Americans that I found on blogs online, as were the photographs. I need to find out if _I_ properly attributed those photographs. I believe I asked for permission, but I may have gotten sloppy in retaining the source records. Please keep in touch with me at diana at dianadiehlpresents dot com. I’d love to hear more about your project.